You may be worried that the iPhone storage would get full by saving all the images and videos that you get on WhatsApp. So, you may stop WhatsApp from auto-saving the images by turning it off in the settings. But, there are some photos you get on WhatsApp that are worthy of saving them to iPhone. In such a case, you may wonder how to save WhatsApp photos to your iPhone. If you permit WhatsApp to access the Photos app of your iPhone, you can easily save pictures from WhatsApp. Let’s see how you can do this by following simple steps. When you grant WhatsApp with access to the Photos app, it will not result in WhatsApp saving all the photos to your iPhone. WhatsApp will not be able to save the photos as long as “Save to Camera Roll” is turned off in the Chat settings. To make sure that WhatsApp is not permitted to save the photos to Camera Roll of your iPhone, follow the steps given below. Step 1. Open WhatsApp on your iPhone and tap on Settings. Step 2. Tap on Chats from the number of options displayed in the Settings screen. Step 3. 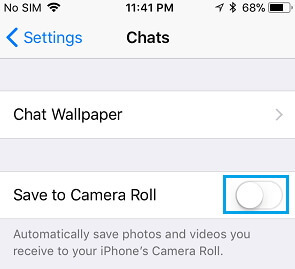 Make sure that “Save to Camera Roll” slider is toggled off in the Chats screen. This will make sure that WhatsApp will not dump all the incoming photos to the iPhone. Before you can save selected photos to the Camera Roll of your device, you need to give WhatsApp access to the Photos app of your iPhone. Step 1. Open Settings on your iPhone. Scroll down to find “Privacy” and tap on it. Step 2. Tap on “Photos” in the Privacy screen and then on “WhatsApp”. Step 3. In the next screen, under Allow Photo Access, select “Read and Write”. Step 4. 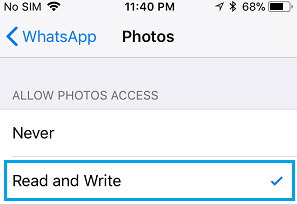 With this step, you have granted WhatsApp to access the Photos app of your iPhone. Now, you can manually download and save WhatsApp photos to your device’s Camera Roll. Refer the steps given below to manually save WhatsApp photos to the Camera Roll of your iPhone. Step 1. Open WhatsApp on your device and tap on Chats at the bottom. Step 2. All your conversations will be displayed as usual. Now, tap on the chat that contains photos you need to download. Step 3. On the personal chat window, choose the image you want to download to your iPhone. Step 4. The corresponding image will get opened. Now, tap on the Share icon at the bottom left. Step 5. Various options will be displayed. Tap on “Save” option. The selected photo will get downloaded to your iPhone. You can also save the WhatsApp photos to the Camera Roll without first providing WhatsApp with access to Photos app. In this scenario, WhatsApp will ask you to give permission to access Photos app when you try to save WhatsApp photos directly. You can grant permission by tapping on “Allow” option in the menu that appears. If you are looking to save pictures from WhatsApp without any hassle, you can use an advanced data recovery tool. iMyFone D-Back is one such software that will allow you to save WhatsApp photos on your iPhone. It supports all the iPhone and iPad that are running on any iOS version. You can easily save WhatsApp pictures from your iPhone or iTunes and iCloud backup. It supports other 18 file types from iPhone such as call logs, contacts, voice memo, notes and etc. Step 1.Open iMyFone D-Back and select “Recover from iOS Device”. Click “Start”. Connect your iPhone to the computer. Click “Next” when your device is detected successfully. Step 2.All types of recoverable files will be displayed. Choose “WhatsApp” under Third Party IM App and click “Scan”. Step 3.Upon scanning, all the WhatsApp data will be shown. Select the photos that you want to recover and click “Recover”. Choose the location for saving the WhatsApp photos on your computer. All the photos will get stored in the selected folder. Step 1.Open iMyFone D-Back and select “Recover from iTunes Backup”. Click “Start”. The iTunes backups will be displayed. Select the appropriate one and click “Next”. Step 3.All the WhatsApp data will be shown once the scanning is completed. Select the photos that you want to recover and click “Recover”. All the photos will get stored in the selected folder. Step 1.Open D-Back and select “Recover from iCloud Backup” to start. Sign into your iCloud account with Apple ID and password. Step 2.The iCloud backups will be displayed. Select the appropriate one and click “Next”. Step 3.All types of recoverable files will be displayed. Choose “WhatsApp” under Third Party IM App and click “Scan”. Step 4.When scanning is over, all the WhatsApp data will be shown. Select the photos that you want to recover and click “Recover”. Choose the location for saving the WhatsApp photos on your computer. You can manually save pictures from WhatsApp by opening WhatsApp and then selecting the photos of each contact. It can be done easily on your device itself. However, this process is time-consuming as you need to open each chat on your WhatsApp and then choose individual photos for saving. When you use iMyFone D-Back, you can save all your WhatsApp photos at once. You can save those photos either from your iPhone directly or from the iTunes/iCloud backups. If you are thinking how to save WhatsApp photos, view the above-given methods carefully. After checking all the methods in this guide, you can choose the one that you trust. All the methods given above are secure and can easily save WhatsApp photos from your iPhone. 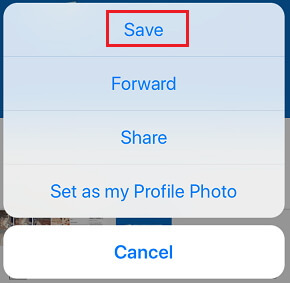 You can leave your comments below if you have any other method for saving WhatsApp photos.